My day in the kitchen started at 11 AM this morning when Jon whipped up a fantastic marinade for our London broil while I was doing some other preparations. 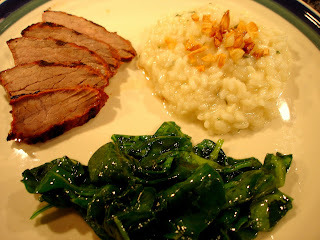 We served the London broil with a new creation of mine, three-garlic risotto, and sauteed spinach. We let the London Broil marinate in the fridge for about 7 hours. 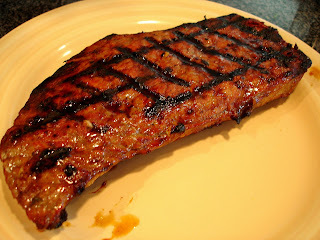 Jon is so good at coming up with ideas for marinades - we loved this one!! He grilled the London broil for about 18 minutes. It was medium-well to well on the edges (for me) and medium in the center (for him). Add the rest of the raw garlic and the onions to the oil. Saute for 2-3 minutes. Add the butter and rice; stir for 1 minute. Add the white wine and stir until it is absorbed. Add the chicken broth 1 ladle-full at a time, letting it fully absorb before adding more. This process takes about 17 minutes. Before the final ladle of broth, add the roasted garlic. When your final ladle of broth is halfway absorbed, add the cheese. This is my trick for making the risotto creamy. Finally, add the parsley and truffle oil. Serve immediately; top with the toasted garlic. I love the different flavors of the toasted, roasted, and sauteed garlic. 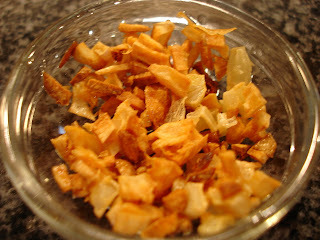 The toasted garlic infuses the oil, and adds a nice crunch and flavor when you use it as a garnish. The roasted garlic is sweet, but the sauteed garlic keeps the risotto from becoming too sweet. I'll definitely make this one again. 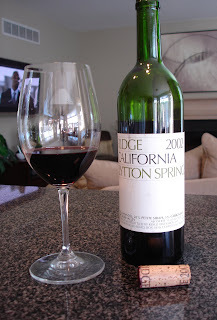 A few years ago we had a housewarming party, and someone brought us a bottle of 2002 Ridge Lytton Springs. I wish I knew who brought it for us so we could thank them for introducing us to it!! We fell in love with this wine but were only able to find it to buy one time. Ever since, we have searched for it, but since it is a 2002, it's almost impossible to find. Finally, last week, Jon found six bottles at a store about 2 hours from here. He was headed up that way for a poker game last week, so he stopped by the store and bought the last six bottles. We both agree that this is one of the best, if not the best, red wine we've ever had. This bottle proves that you don't need to spend a ton of money for amazing wine - it was $35 a bottle. It is 75% zinfandel, 20% petite syrah, and 5% carignane. It is full, but not heavy; flavorful without being too oaky or woody. It's just about the perfect wine. I hope we can make these last 5 bottles last... luckily we hid them in the basement so we aren't tempted to open them too soon! 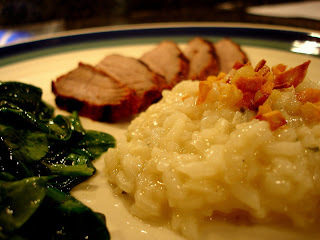 Mary Ellen, that Risotto sounds and looks like Heaven!! I love your recipes, you continuously add your touch to familiar comfort foods with outstanding results! Aww, thank you! That's what I love about cooking - experimenting and adding my own touches. The risotto looks so good! I am a garlic lover and this sounds right up my ally. I will definitely be giving this a try!